In 2008 we started the Sean O’Shea Foundation yoga program in 3 schools with a total of 83 students. Today we serve thousands of children and have served over 88 schools with our yoga and nutrition programs! We focus on all schools and organizations and especially have focused on at-risk children to help combat a great deal of stressors and challenges these kids go through. These are kids dealing with extreme stressors, trauma and abuses in their lives, stressors like: Chronic stress, toxic stress, traumatic stress, and primary and secondary post-traumatic stress. While there are no single fix all solutions, there is evidence that suggests that these problems may be open to the practices that have been shown to redirect attention, improve concentration, increase self-control, and give youth reliable and healthy coping mechanisms in the face of this stress and trauma which can lead to serious issues. One of the issues our country faces today is the massive school dropout rate. The national dropout rate is between 25% and 35%, and up to 50% in some inner city schools. Cecelia Rouse at Princeton estimates that one high school dropout “costs” about $260,000 in lost earnings over his or her lifetime. Given the fact that at least a million kids drop out of school every year, the annual cost of school failure alone is estimated at $260 billion. As BK Bose of the Niroga Institute points out, “Over ten years, the cost is upwards of 3 trillion dollars. This program is offered as a before school, after school or during school program. The class runs once a week (Approximately one hour each) for seven weeks. The program consists of nutrition, Eco-green and conservation lessons as well as the basic yoga poses, breathe exercises and meditations that help students understand the benefits for body and mind. This program runs throughout a school semester and is instructed by the foundation yoga teachers for the first 12-24 weeks and is recommended for fall programs. The program consists of nutrition lessons, Eco-green and conservation lessons as well as the basic yoga poses, breathe exercises and meditations that help students understand the benefits for body and mind. 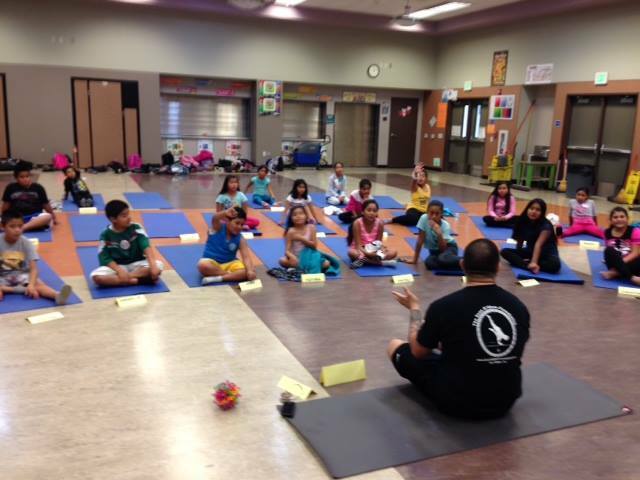 The foundation has yoga mentors who are available for assistance to any of the schools participating in this program. This program begins and ends with the school year and is instructed by the foundation yoga teachers. The program consists of nutrition lesson from a certified dietician, Eco-green and conservation lessons as well as the basic yoga poses, breathe exercises and meditation that help students understand the benefits for body and mind. This program can be once a week but can be daily or altered for any amount of days of the week to accommodate the school program. This program consists of 15-minute programs for three or more classes within a one hour program. We will offer breath exercises, chair poses and meditation. We can serve the entire school (3 classes per hour) as many day of the week requested. This program is our calming activity for learning mindfulness ages 5-18. We can also offer the Transformative Life Skills program upon request. This program is offered to elementary, middle schools and high schools. Certified dieticians, nutritionists or health educators will come to your school and present a 30, 45 or 60 minute nutrition lesson giving the students tips to better eating habits, share their expertise in nutrition value in calorie intake, and encourage the students the importance eating more fresh and less processed foods. Many of the medical concerns related to obesity will be shared as well. Lastly, the students will have a better understanding of the food groups, greater knowledge in read food labels and the importance of developing a healthier body, and maintaining mental and physical energy. This presentation uses a Power Point visual as well as on hand visuals. Recommended for a classroom or assembly presentation. The Foundation offers an orientation and mini training for all SOSF volunteers and contracted yoga teachers. This orientation is offered bi annually and includes Foundation curriculum, basic tips to better understand working with kids, health issues, concerns for the young population of our communities, foundation policy and presenting yoga to at-risk youth. Yoga can be a powerful tool to help kids with academics, sports, and anger issues, stress and improve the present physical health. If interested…simply email us. It is recommended that you fill out a Teacher/volunteer application that can be downloaded from our website at www.seanosheafoundation.org. This is a great opportunity for the schoolteacher to use daily with the classroom and carries many benefits to calm the classroom. This is a two-hour training and highly recommended for schoolteachers, school counselors, school psychologists, physical therapists, yoga teachers working with seniors, caregivers, nurses, etc. This training is usually offered in spring and in fall. The Sean O’Shea Foundation offers one-on-one yoga, breath exercises and meditation for children with cancer at Rady’s Children’s Hospital every Monday, Wednesday and Saturday. The team of yoga teachers are experienced and trained to work with the children and are most compassionate and caring. We recruit volunteer’s bi-annually to serve on this team. This program works with parents at schools that are participating with our SOSF programs. Any participating school can request this program and is highly recommended. The program runs for two weeks and any parent can sign up to participate. Classes consist of yoga and nutrition lessons allowing the parent to have a better understanding of our program and allows the parent and child to share their SOSF yoga and nutrition experiences. The Sean O’Shea Foundation supports garden to table lessons and experiences that allow the children to better understand the origin of real food, natural foods and organic foods. Schools can apply for scholarships to help support their gardening projects and their school gardens. This training runs once a year, usually in spring and is a one day workshop. It is recommended for certified yoga teachers wanting to work with children. It runs for 8 hours usually on a Saturday and consists of learning compassionate classroom management skills; learn to teach diverse populations, how to create lessons and sequences for youth ages 8-18 and experience on hands exercises and demonstrations. Teachers will leave the training feeling more confident and ready to work with children. NOTE: Partial and full scholarships are available to Title One schools and organizations working with a high percentage of at-risk youth.